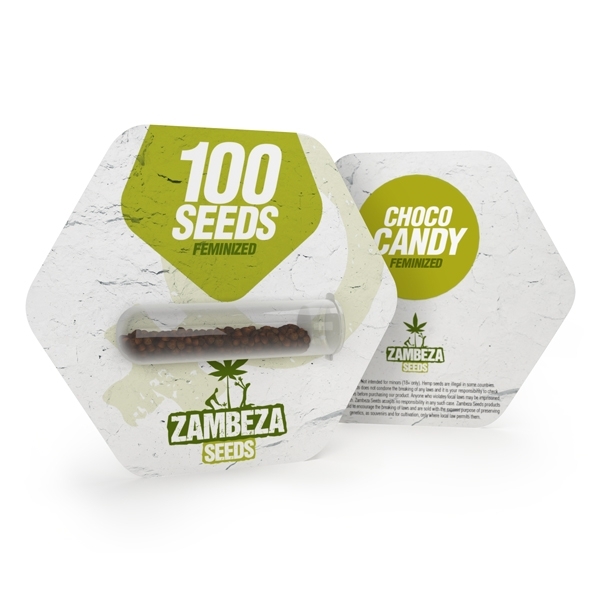 Zambeza didn’t just want to create a spectacularly tasting chocolate strain when they set out to make their Choco Candy. With her big potency, a rather short flowering time and a fantastic Haze high, Choco Candy turned out a truly excellent sativa-dominant strain not just when it comes to her incredible chocolate taste. The cross between a Chocolate Haze and an OG Chocolate Thai doesn’t hide the fact that she’s a sativa when you grow her. Indoors, you can expect her to get 100-150cm tall where you can look forward to respectable yields of up to 400-450g/m². Outdoors, the plant will normally grow to 120-200cm where you can look forward to harvests of up to 500g per plant in optimal conditions. Given her medium height and her good visibility and yield ratio, Choco Candy is well suited for guerrilla grows. You may possibly know that Hazes are always taking a little longer to flower, but Zambeza managed to cut her flowering down to 65 days which is quite short for a Haze of her quality. When smoked, Choco Candy will tickle the palate with her very prominent chocolate aroma, no surprise there, but the intense chocolate flavour is also perfectly nuanced with some fresh and sweet notes making for an extraordinary smoking experience. Thanks to a very impressive 21% of THC, she’ll give a fast-hitting, cerebral high that is euphoric and uplifting. This awesome smoke will give you a boost of creativity and positive thoughts, just perfect to lift your mood every single day! Choco Candy by Zambeza isn’t just an excellent Haze that may well become a favourite for chocolate lovers. With staggering potency, good yields and her spectacular Haze high, she won’t disappoint when it comes to her other qualities as well. This is a top-grade Haze that should be high on your list of strains to grow if you love sativas! Zambeza offers Choco Candy bulk seeds in packs of 100 seeds, which makes her a good choice for anyone who needs more seeds of this truly excellent Haze.